Maria and I would like to thank you for the professional and personal way in which you arranged for the recent sale of our home. We had been apprehensive with regard to the intrusion into our private lives relative to the sale of our property, particularly with regard to the preparation and ongoing commitment we would have had to incur in selling a house in the upper price bracket category. Maria and I have heard of time frames in excess of four to five months to sell houses and such a situation could have meant that Maria and I would only leave our home in wooden caskets. In fact, we know of people in our situation who should, in fact, downsize but are reluctant to do so because of the trauma and inconvenience of selling their homes. Our experience with you was as smooth as velvet. We felt at no time pressure in the process and your professionalism was outstanding not only before and during the sale but in the after sale service which you lavished on us. 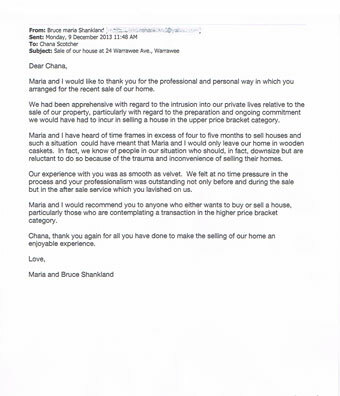 Maria and I would recommend you to anyone who either wants to buy or sell a house, particularly those who are contemplating a transaction in the higher price bracket category. Chana, thank you again for all you have done to make the selling of our home an enjoyable experience. I have known Chana Scotcher for over twenty years, since her time with Asset Real Estate at Turramurra. Over the years Chana has shown me through many of her listings and I have always been impressed with her professionalism, knowledge of the market and sound advice. Chana recently sold our home at Wahroonga. During the selling process, Chana acted for us sensitively and professionally following the sale closely from exchange to settlement. I can recommend Chana Scotcher. She has a solid client data base and will work tenaciously and professionally to secure the sale of your property. 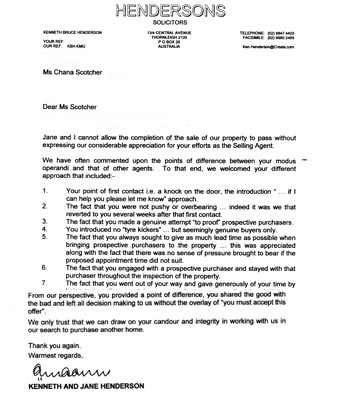 We have known Chana Scotcher for a number of years and would like to place on record our sincere appreciation to her for affecting the sale of our home. Chana’s excellent negotiation skills achieved a record price for the suburb of Gordon. 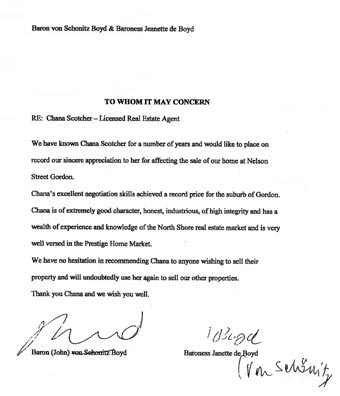 Chana is of extremely good character, honest, industrious, of high integrity and has a wealth of experience and knowledge of the North Shore real estate market and is very well versed in the Prestige Home Market. Once on the market the house sold reasonably quickly. This was largely because it was Chana who was instrumental in having suitably qualified prospective purchasers view the house whom she followed up conscientiously. During negotiations and during the finalization of the agreement she took care to state matters accurately and not excessively and was balanced in her dealings with the vendor and purchaser. She displayed good judgment and an honourable approach in her dealings. As one who has been a litigation partner in one of the leading law firms in the country I would not hesitate to recommend Chana Scotcher to anyone requiring a licensed real estate agent of capacity, integrity and industriousness. Your point of first contact “if I can help you please let me know” approach. The fact that you were not pushy or overbearing. The fact that you made a genuine attempt to “proof” prospective purchasers. You introduced no “tyre kickers” but genuine buyers only. The fact that you always sought to give as much lead time as possible when bringing prospective purchasers to the property… this was appreciated along with the fact that there was no sense of pressure brought to bear if the proposed appointment time did not suit. The fact that you engaged with a prospective purchaser and stayed with that purchaser throughout the inspection of the property. The fact that you went out of your way and gave generously of your time by being personally present (on occasion for hours on end) while a building or pest inspection was taking place. The fact that you followed through with the ultimate buyer, fielded their questions and addressed any concerns. 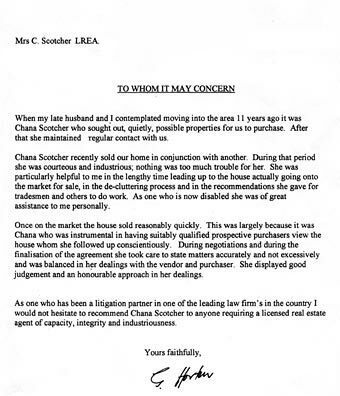 I write to advise that I have known Chana Scotcher since 1992 when we bought an investment property at Wellesley Road in Pymble. We have worked with Chana on numerous properties since. She was involved with the marketing of our Kirribilli block of eight apartments. Chana also achieved an excellent price for our Killara home when we put it up for sale, however we decided not to sell as we could not find a satisfactory home to move to. 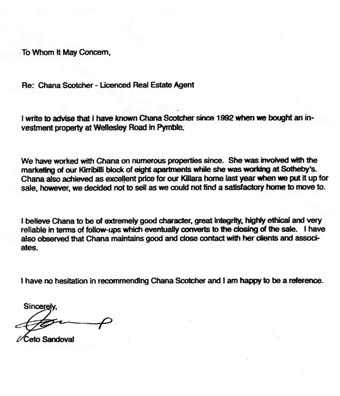 I believe Chana to be of extremely good character, great integrity, highly ethical and very reliable in terms of follow-ups, which eventually converts to the closing of a sale. 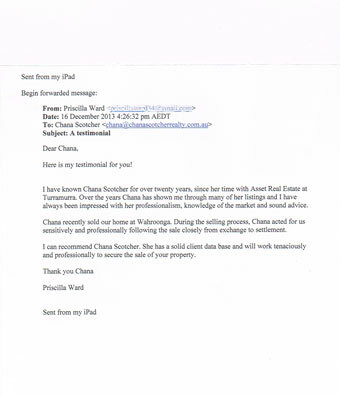 I have also noticed that Chana maintains good and close contact with her clients and associates. 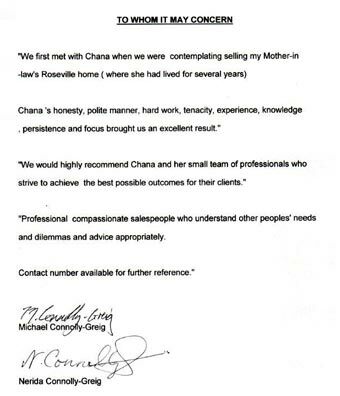 We first met with Chana when we were contemplating selling my mother-in-law’s Roseville home (where she had lived for several years) Chana’s honesty, polite manner, hard work, tenacity, experience, knowledge, persistence and focus brought us an excellent result. We would highly recommend Chana and her small team of professionals who strive to achieve the best outcomes for their clients. Professional, compassionate salespeople who understand other people’s needs and dilemmas and advise appropriately. Contact number available for reference.